MARGARET CHASE SMITH was a freshman in the United States Senate and a party loyalist. So she had every reason to remain quiet, in the spring of 1950, as fellow Republican Joseph McCarthy rose to national prominence on a platform of xenophobia and spectacular insinuation. But Smith, the only woman in the Senate, saw something dangerous in her colleague’s demagoguery. Something deeply un-American. On June 1 of that year, the Mainer rose to deliver one of the most storied speeches in American political history. Almost 70 years later, the American people need another Republican senator from Maine, Susan Collins — who sits at Smith’s desk and wears her golden brooch — to stand up to another demagogue trafficking in fear, ignorance, bigotry, and smear. Susan Collins is the most senior female senator in the Republican caucus. Arguably, the stakes are even higher. President Trump would poison not just our politics, but also our environment. He threatens not just our domestic civil liberties, but also our moral standing in the world — undermining a security alliance that’s served the West well for decades while he’s also embracing murderous strongmen from Manila to Moscow. Unless individual Republicans agree with the direction Trump is leading the nation, it’s time they stood up and did something about it. With their party holding a slim majority in the Senate, all eyes are on Collins and a handful of other independent-minded Senate Republicans — John McCain, Lindsey Graham, and Lisa Murkowski among them. It’s only a little hyperbolic to say they hold the fate of the nation in their hands. And it’s not hyperbolic at all to suggest that the future of their own party is at stake. An essential question for Collins, as heir to Smith, is this: Will she settle for being standard-bearer for the party of Trump? Fortunately, Collins has shown some early flashes of courage. During the campaign, she published an opinion piece in The Washington Post declaring that she could not vote for Trump, citing “his constant stream of cruel comments and his inability to admit error or apologize.” Since then, she has criticized the president’s shameful Muslim ban and voted against his polluter-friendly pick to head the Environmental Protection Agency, Scott Pruitt. And she tweeted her disapproval when the president pulled out of the Paris climate change accord. Later, when it appeared increasingly likely that Trump was trying to interfere with the investigation, she offered only half-hearted support for the idea of a special prosecutor in the Russian affair — fully endorsing the concept only after the Justice Department named Robert Mueller to the post. Those decisions highlight a long-running cautious streak in Collins’s politics, a deference to the executive branch that may have been reasonable in the past, but must be dialed back now for an administration that has earned no deference whatsoever. 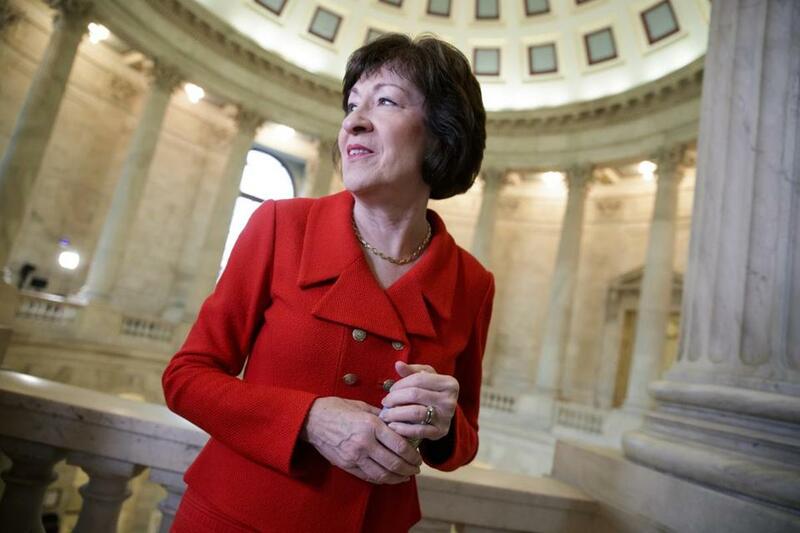 OF ALL THE moderate Republicans in the Senate, Collins is best positioned to lead. Her state has a long tradition of rewarding independence and bipartisanship. Indeed, it is one of the few places that still does. She is far more popular in Maine than McCain in Arizona or Graham in South Carolina. And she has little reason to fear a serious challenge from the right, whether she runs for reelection or jumps into her state’s gubernatorial race instead. In the months ahead, it is critical that she abide by that pledge. She is one of a handful of Republicans likely to play a decisive role in the Intelligence Committee’s investigation, just as she is in the broader Senate’s debates on the environment and health care. Her state has a lot riding on those debates. Maine’s rocky coastline and iconic forests will suffer if the president’s draconian cuts to environmental protection go through. Meanwhile, the House Republican plan to repeal and replace the Affordable Care Act would leave 117,000 fewer Mainers with insurance by 2026, according to an analysis by the Center for American Progress — nearly 1 in 10 of the state’s residents. It’s not just the elderly and rural who could be hurt. Alison Harris, 56, who lives just outside of Portland, cried in her shower for an hour on election night. “It’s so scary when it’s your child,” she said. Her daughter, Robin, was just 7 when she stepped out of a pond after a swim looking a worrisome shade of blue; the cardiologist said she had never seen a kid that sick walk in off the street. The recommendation for a heart transplant was hard for Harris and her husband to hear. But after Robin collapsed in the kitchen while performing a magic trick, they put their daughter on the wait list. She was 8 when she had the surgery. Robin is 26 now, and doing fine. But there have been scares. Continuous coverage is a must. Harris worries that her daughter will struggle to pay for insurance down the line if the House plan passes; Robin, after all, has a preexisting condition. Harris worries about her own care, too. She runs a small marketing firm out of her home and buys insurance on Maine’s Obamacare exchange. Collins says she’s opposed to the House plan. She and Senator Bill Cassidy of Louisiana, a physician, have proposed an alternative that would allow states to keep Obamacare, if they choose, or use the federal funds to develop their own plans. It’s a reasonable compromise. But it hasn’t gained much traction. 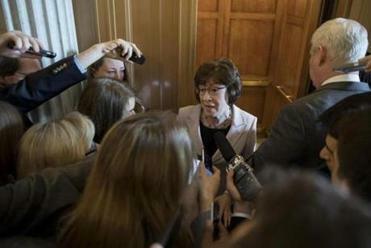 Majority leader Mitch McConnell did not include Collins in a 13-member health care working group charged with developing proposals that can pass the Senate. In the coming weeks, it is essential that Collins draw more attention to her plan. If she doesn’t make progress there, she’ll have to resist substantial intra-party pressure to vote for a lesser bill that strips too many Mainers, and too many Americans, of care. SUSAN COLLINS WAS a high school senior from the small northern Maine town of Caribou when she stepped onto an airplane for the first time in 1971 and flew to Washington to participate in a Senate youth program. She had a quick photo-op with her state’s junior senator. But for reasons she still can’t divine, Maine’s senior senator, Margaret Chase Smith, spoke with her for nearly two hours. They talked about politics and policy — about all kinds of things. And the teenager left the meeting clutching a copy of the “Declaration of Conscience” speech, convinced that a woman could do anything. That conviction will be tested as never before in Trump’s Washington. The president and other members of his administration are embroiled in serious ethics controversies. His budget would leave thousands of children homeless and hungry. And he has abandoned an epochal duty to curb climate change. The legacy of Margaret Chase Smith looms large. It’s time for Senator Collins to claim it.